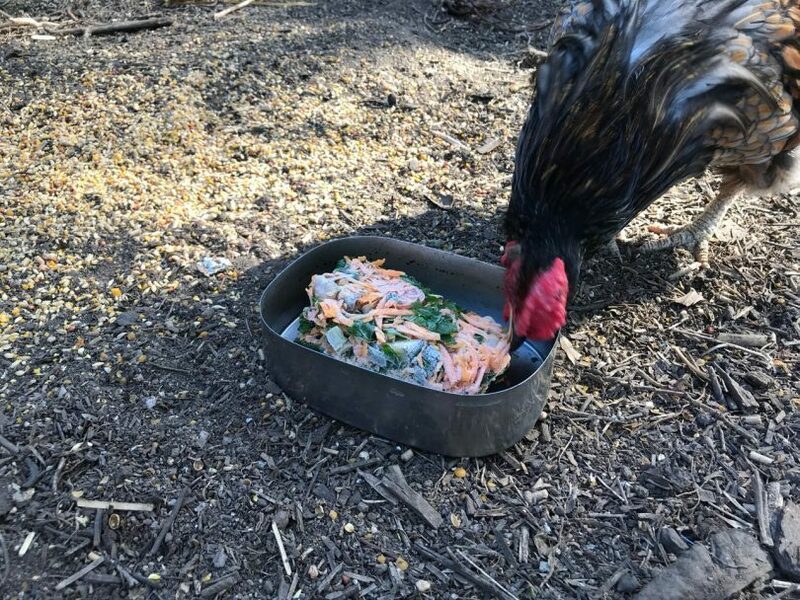 Frozen food will cool your chooks quickly. Frozen watermelon bits, tomatoes, frozen shredded carrot, silverbeet or excess zucchini cut in half. Photo: Geoffrey Grigg. Summer can be a tough time for your chookies. The little critters can’t sweat, all they can do is pant to stay cool. Chooks won’t drink warm water, so keep their water in the shade. 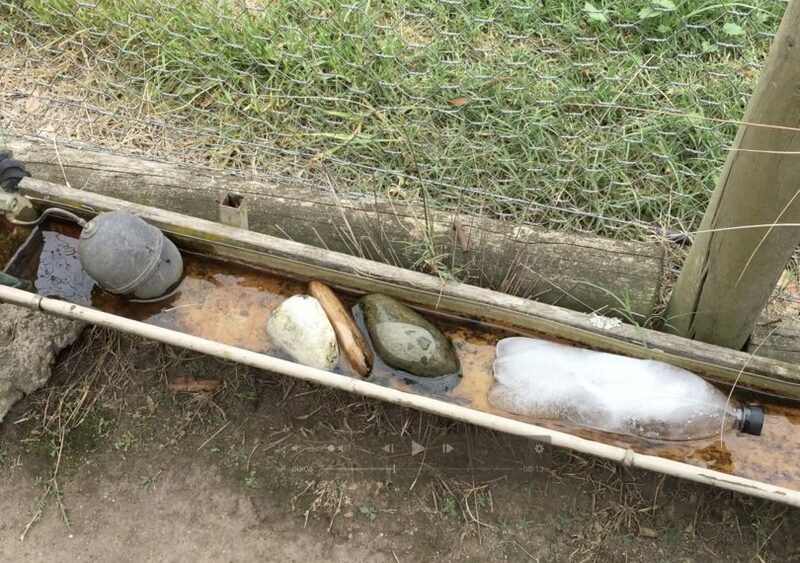 On hot days drop a frozen water bottle into their trough. Rocks in the water also provide a landing pad for bees to come and have a sip when they need it. Frozen food cools them quickly. 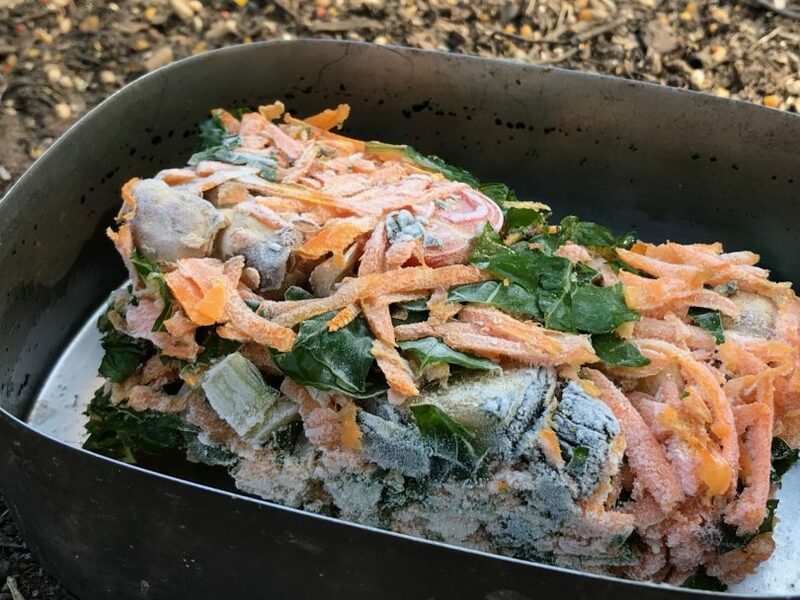 Frozen watermelon bits, tomatoes, frozen shredded carrot, silverbeet or excess zucchini cut in half all make it easier for them in the heat of the day. Freeze your leftovers (pasta, mince, veggies) and they’ll be entertained, nourished and give you a few gold stars! Sometimes it’s just too hot and they fall over from heat stress. You can give them a gentle cooling bath. Chooks need shade where they can lie on the cool ground and chill. Ideally, they’ll have a tree to camp under. Insulate their roof, northern and western sides with shade cloth, a tarp or cover their chook-house with passionfruit, kiwifruit or other vines. Leave the eastern side open to the cooling sea breeze. Anything that creates stress, like mite infestations, makes life harder in the heat. Use Super Mash monthly to reduce mites and help them be at their best. Make sure they get fresh greens every day. Good luck girls, we have your back! Rocks in your chooks’ water provide a landing pad for bees, while the frozen water bottle keeps the temperature down for your girls to drink. Photo: Geoffrey Grigg. Despite their soft and delicate appearance, Silkies are quite a robust little bird. The most well-documented point of origin for the Silkie is ancient China. Silkie feathers don’t have tiny barbs to keep the feather strands together, giving them a soft and fluffy appearance. They lay small cream coloured eggs which are quite eggceptional having big deep yellow yolks with not so much white. You can eggspect three to five eggs per week from a Silkie. Laying is often stopped as they have a tendency to go broody, so expect 100-120 eggs in an ideal year. Silkies also have several quite unusual qualities such as black skin and bones, blackish blue meat, blue earlobes and five toes on each foot, whereas most chickens have only four. Asian cuisines consider Silkie meat a gourmet food. Silkies are docile and tend to not make a big mess of your garden. 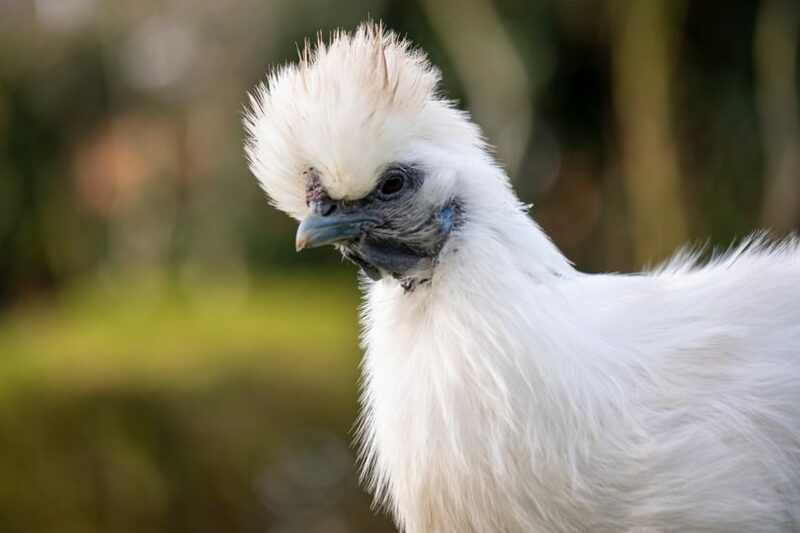 Silkies are thought to have originated in ancient China. Because the females are great mums and often broody, they are used to hatching the eggs of other hens. Silkie roosters are not as loud as other breeds and more easily tamed, good to have in an urban setting. Their pretty plumage keeps them quite insulated, so they are able to thrive in both cold and warm climates. Silkie feathers are more like fur so they will need protection from the rain. Silkies are susceptible to scaly leg, so coat legs with cooking oil weekly or monthly. They can be vulnerable to an infestation of mites and lice because of their fine plumage so make sure good dust baths are available. Use Super Mash as an antiparasitic treatment which helps keep on top of the mites. A Silkie will often live between seven to nine years depending on the care given to them. Some Silkies have been known to live longer, so with lots of TLC, you’ll have your sweet Silkie for many years to come! Help your chooks beat the summer heat and freeze your leftovers. They’ll be entertained, nourished and give you a few gold stars. Photo: Geoffrey Grigg. Cheryl Nelson is the brains and heart behind Natural Chicken Health. Subscribe HERE to the Natural Chicken Health Monthly Newsletter Vlog and follow Natural Chicken Health on Facebook. Original Article published by Cheryl Nelson on About Regional.